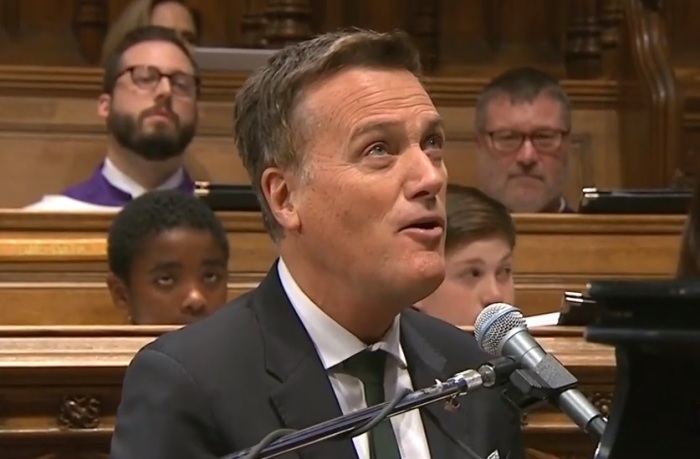 Attendees of President George H. W. Bush’s funeral on Wednesday were serenaded by Grammy Award-winning Christian singer-songwriter Michael W. Smith at the late president’s request. On the day before Bush’s memorial service at the Washington National Cathedral, Smith sat down with the Christian Broadcasting Network to talk about his decades-long relationship with the one-term president and former vice president. Smith, who is known for his career as both a mainstream and contemporary Christian artist, explained that the last time he saw 41st president was about three months ago. During their meeting, Smith said, he was asked by the 94-year-old if he would sing his 1982 song “Friends” at his funeral service when he passed away. "As we were leaving, we just gave him a hug and said 'We love you. We love you. So good to see you,’” Smith told CBN News. "And about the time we leaving, he put his finger in the air and had that sparkle in his eyes and said: 'Friends are friends forever.' Deb and I walked out of there thinking this might be the last time that we see him." To Smith, there aren’t enough words to describe the honor of being asked to sing at Bush’s funeral. Smith was accompanied in performing the song by the Armed Forces Chorus, the U.S. Marine Orchestra and the National Cathedral Choir. He also posted a rehearsal video of the performance to his Instagram page on Tuesday. In a 2003 op-ed published by Crosswalk.com, Smith explained how his friendship with Bush began in 1989 when he performed in NBC’s “Christmas in Washington” special. Smith explained that he would find himself a few months later in a heated tennis match with Bush’s son, George W., who would later go on to become president in 2001. Along with performing at George W. Bush’s inauguration in January 2001, Smith also performed at Billy Graham’s funeral in North Carolina and the late evangelist’s memorial service at the U.S. Capitol earlier this year. Bush’s funeral was attended by all living former presidents as well as President Donald Trump and First Lady Melania Trump. Eulogies were given by George W. Bush, former Canadian Prime Minister Brian Mulroney, former Republican Sen. Alan Simpson of Wyoming and Jon Meacham, who authored a biography titled Destiny and Power: The American Odyssey of George Herbert Walker Bush. The homily was given by the rector of St. Martin’s Episcopal Church in Houston, Russell Levenson Jr., a close friend and family pastor. Follow Samuel Smith on Twitter: @IamSamSmith, or Facebook: SamuelSmithCP.